We are gamers, just like yourselves. It’s our pastime, our hobby. Heck, with little ones running around, some days it’s the extent of our social life. We love the play, we love the grind (ok, maybe not so much), we love being able to hurl fireballs at digital demons at the end of a particularly hard day. A few years back, we created a new super-group in City of Heroes along with several extended family members and other players we’ve collected through the years of playing the game. It began as a joke. In one of the game updates, Issue 9: Breakthrough, the Wentworth’s Consignment House was added to various zones hero-side. 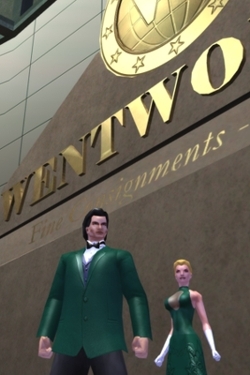 We came up with the idea to play the “owners” of Wentworth’s and so the Wentworth’s Country Club was born. While running around and role-playing well heeled marketers was fun, we found great satisfaction in giving new players and characters a leg up with random gifts of influence, essentially being charitable in game. As players, we cooperate to run Task Forces, to take down zombies and Rikti Invaders, and to occasionally gather for a costume contest or two. When we leave the game, our super powers don’t come with us…but that doesn’t mean we’re powerless. We are a very large group of people. We -can- step up and become Real World Heroes.